San Diego home prices dipped one tenth of a percent between November and December of last year as the nation’s real estate market continued to slow, according to the Standard & Poor’s Case-Shiller Home Price Indices released Tuesday. The monthly decline into negative territory took place in half of the 20 large cities tracked by the indices. 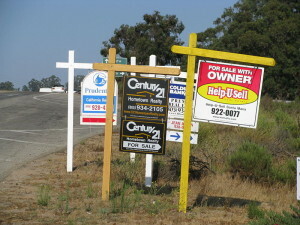 For sale signs in California. Photo from Wikimedia Commons. Annual gains from December 2012 to December 2013 continued to be in double-digits in most places, however. In San Diego, the yearly climb was 18 percent. David Blitzer, chairman of the Index Committee at S&P Dow Jones Indices, said the year-to-year pickup gave Case-Shiller its best year since 2005. The number of permits for new housing starts and sales of existing homes have dropped recently, while high prices and climbing mortgage rates are making homes less affordable, he said. The indices were created by taking the price of homes in January of 2000, assigning them a value of 100, and tracking their subsequent rise and fall. San Diego’s index figure in December was 193.87, reflecting an appreciation of nearly 94 percent in home values over the past 14 years. That rate was topped only by Los Angeles and Washington, D.C. The national 20-city index stood at 165.69, a drop of 0.1 percent in December, but a gain of 13.4 percent since December 2012. A separate 10 city index was at 180.13, unchanged in December and gain of 13.6 percent for the year.